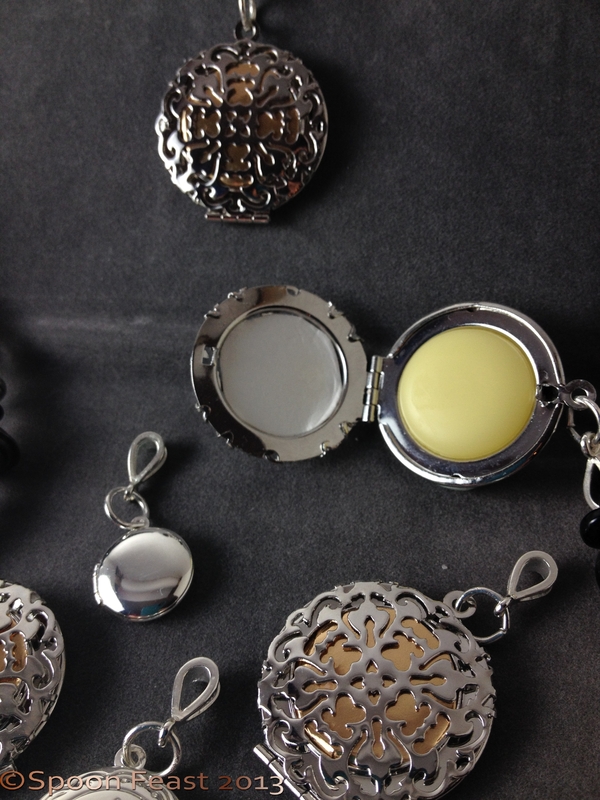 Solid perfume lockets are a beautiful fashion accessory that the women in your life will certainly enjoy. These are quite easy to whip up in your kitchen too. 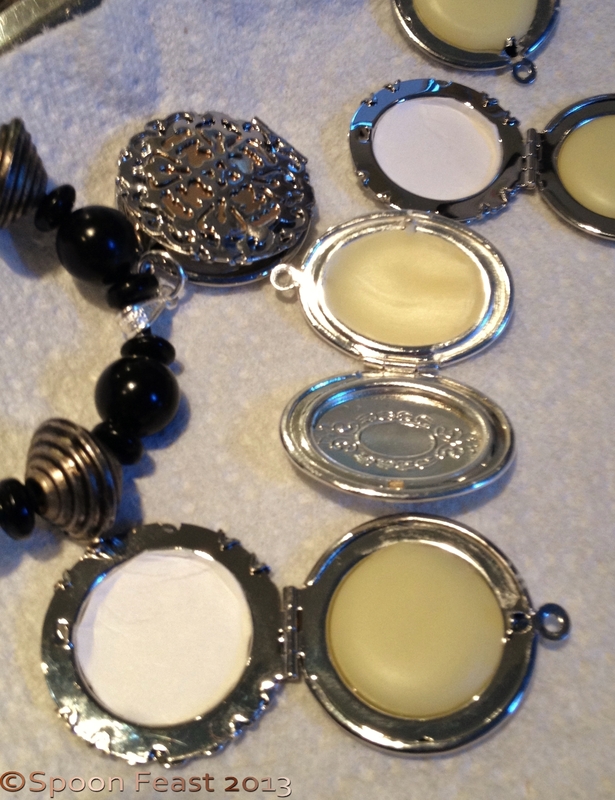 I first heard about making these lockets from Rosalee de la Foret in the Learning Herbs Course I’m taking. It was a gift suggestion she thought would be better received than burdock tincture. I fell in love with the idea and thought it would be rather hard to find lockets. 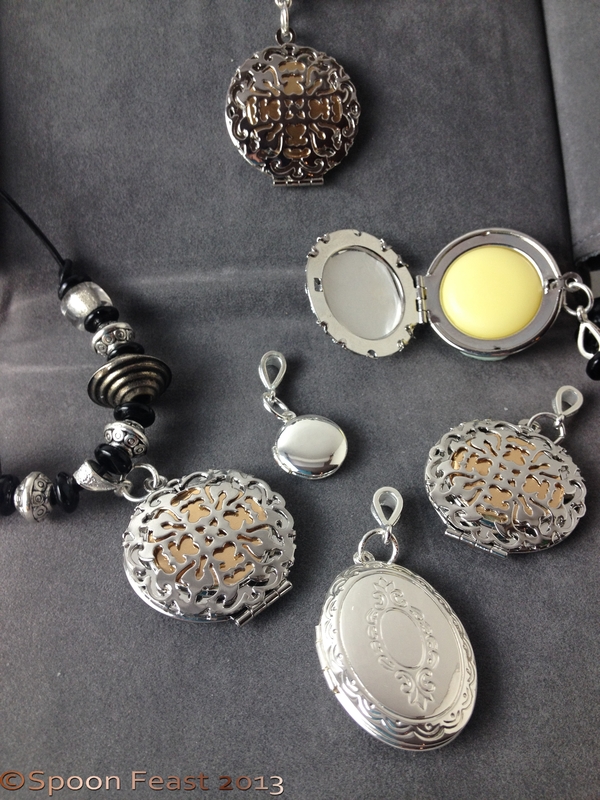 If you look around flea markets, yard sales and craft stores, you can find a variety of old and new lockets. I was lucky enough to find six of them! These are all new, but now I’ll be keeping my eyes out for lockets everywhere, especially when I get to hit the Parisian flea markets in May. Oh, did I mention, I’ll be going to Paris in May? I’m taking students, but still, it’s Paris! I’ll have to take a perfume locket so I can smell Parisian and look fashionable too. Making the solid perfume inside is easy. You can scent the base with your favorite perfume or scent. 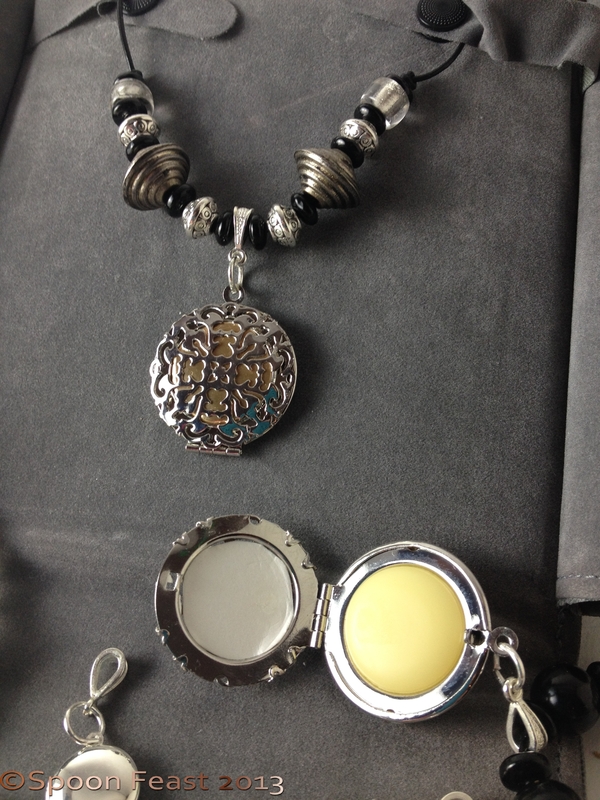 I like to use essential oils and included in this post is the formula I used to make these solid perfume lockets. That’s the base. Melt it together over a double boiler. Once melted add the essential oils or your fragrance. Add 65-70 drops of your chosen fragrance. Yes, you have to use a dropper to measure accurately. So if you don’t have a dropper or plastic pipette, go get some. 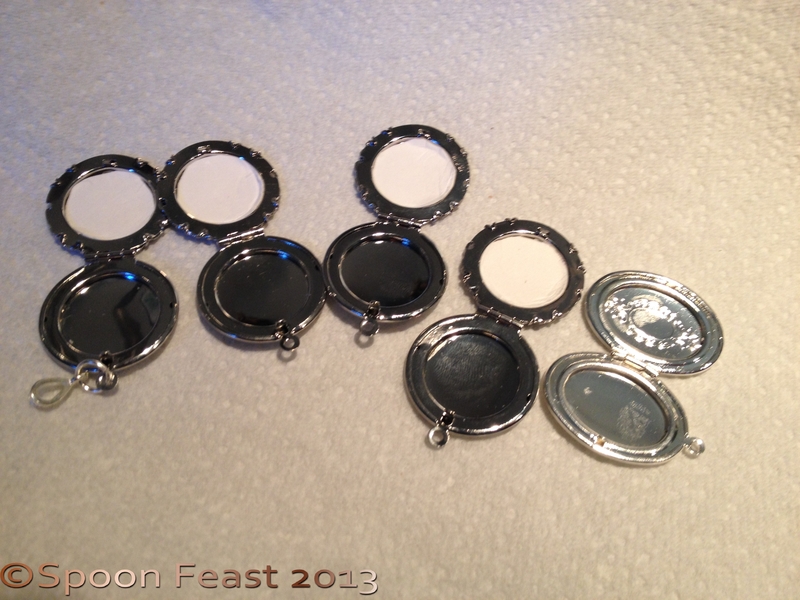 Open the lockets and lay them out for easy and fast filling. 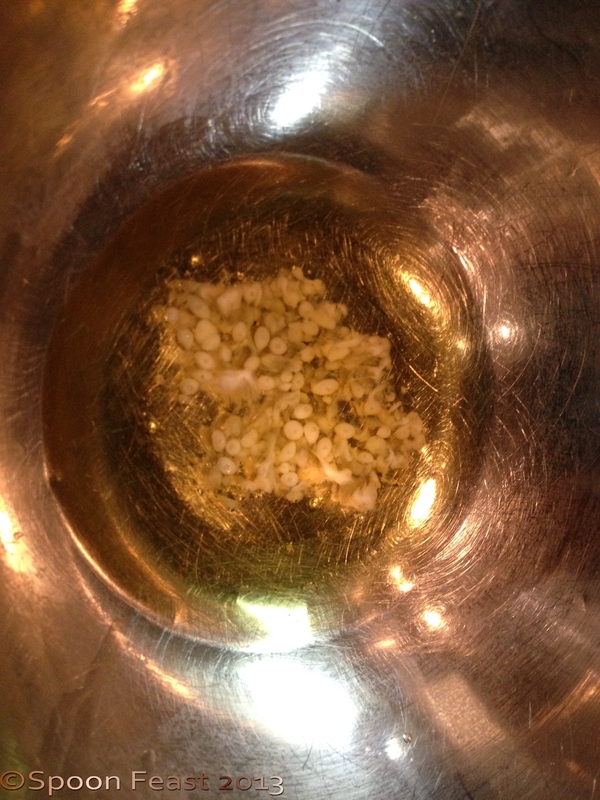 Once poured, allow the perfume to solidify before moving, usually 15-45 minutes. Once the perfume is solid, you can find something to hang it on and enjoy it! I’m giving these as gifts to some friends this year. I hope they like them. Essential oils also have an aromatherapy effect and may not last as long as traditional perfumes. Being a natural product, if you use essential oils, you’ll just have to re-apply it more often. So wear it around your neck and take a whiff when you feel stressed or want to refresh your mind. The above formula encourages feelings of well-being and optimism. I encourage you to try it or make up your own. Lavender Rosemary smells real nice too; there are thousands of options. I think this is a nice idea, thanks Rosalee! This entry was posted in Fun Crafty Things, Recipes and tagged EO, Essential oil, essential oils, Jojoba oil, Neroli, Perfume, Solid perfume. Bookmark the permalink. Pamela, That is a lovely idea. These are so lovely and feminine! I can’t wait to make one, only wish we had some flea markets around the desert. I can’t wait to hear about your Paris trip! It is an unforgettable city and I cannot wait to go back. I bet you could find some at yard sales. It’s funny, Charlotte doesn’t seem to have flea markets as much as other places. I can’t wait for Paris again! Why don’t you come with us?